11 March 2018: Nova’s Birthday Poem is online! We have just posted a beautiful poem that was found in the pages of a journal belonging to Nova Fae. It gives us a glimpse into the timeless and legendary love story that is Kai & Nova. It is truly a treat for the eye to see, so do yourself a favour and give it a read! You won’t regret it! Also, just a reminder that our other short stories can be found directly beneath it, along with our audio log and comments section! So, if you’re feeling particularly adventurous, check them all out and share your thoughts! 4 March 2018: The final Chapter of Dawn of Hope has been released! For our new viewers, it will please you to know that you can read Chapters 1 and 2 in the tabs next to Chapter 3, as well as with Ironwood Pts 1-4 just below them. 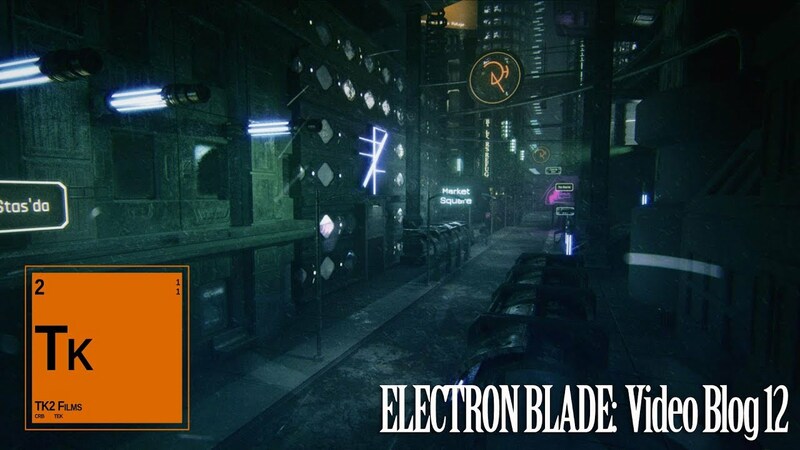 We also have an audio log entry, to which you are welcome to take a listen, and a comments section, should you be bursting at the seems and need to share your excitement over all things Electron Blade! 25 February 2018: Check out Dawn of Hope Chapter 2! It pleases us to inform you that Dawn of Hope Chapter 2, is now available for your viewing pleasure! You can read the first chapter, if you have not already, along with Ironwood Pts 1-4 directly beneath them. Just a friendly reminder that we also have our first audio log released and a comment section, if you want to share your thoughts! 18 February 2018: Our latest short story, Dawn of Hope, is live! Our latest short story, Dawn of Hope, is live with the recent posting of the first chapter! We are so excited to bring to you all some more content from Fal’Rath, so feel free to give it a read! Additionally, you’ll find Ironwood Pts 1-4 directly beneath it if you have not read or finished reading the short story. Don’t forget to tune in to hear Sindricus Molinarian in our first Audio Blog entry directly beneath our short stories section! 11 February 2018: The first two Audio Logs have been released! We are taking a short breather from our Short Stories blog to introduce the first two installments in our Audio Blog! 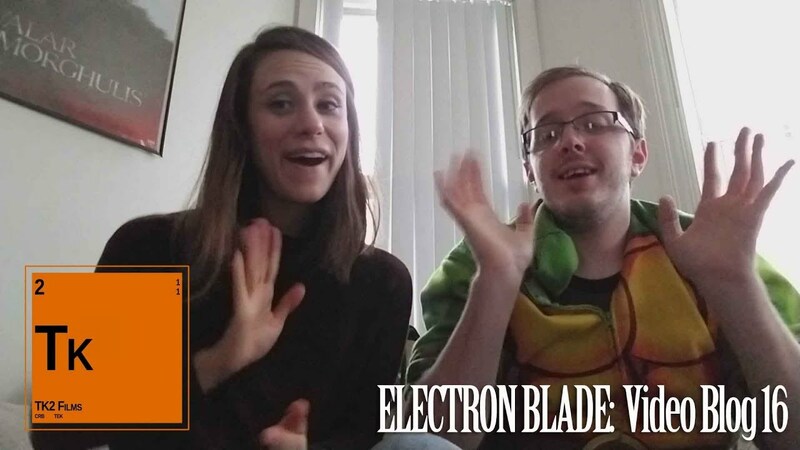 Hear what our characters have to say directly as they take you through their thoughts and experiences in all the action of Electron Blade! It is the perfect time to read or re-read Ironwood Pts 1-4 after hearing from the mind of Sindricus Molinarian in our first Audio Blog entry. If you have any questions or comments, feel free to leave us a message at the bottom of our ‘Short Stories’ section. We love hearing from you wonderful people! 4 February 2018: Ironwood Part 4: A Stranger is posted! We bring to you our latest update: the fourth chapter of Ironwood is now viewable on our Short Stories from Fal’Rath blog page!! As always, you can still view all previous chapters, and you will find that they are now organised into a nice tabbed format for your viewing convenience. Don’t forget to leave us a comment at the bottom and tell us what you think! We love hearing from you! 28 January 2018: Ironwood Part 3: Nova Fae Released! Underground Rejectors: hear my words! The third chapter of Ironwood is now viewable on our blog page: Short Stories From Fal’Rath! I know what a few of you newcomers might be thinking: “PART 3?! I have not read Part 1 or 2 yet!!! !” Not to worry, we still have our previous releases, Ironwood Part 1: Kai Fae and Ironwood Part 2: An Oracle, directly below our latest post for your convenience. Lastly, please tell us what you think! We have a new comments section active below our Short Stories section, and we would love to hear what your thoughts! 25 January 2018: Video Blog 17! Beautiful citizens of Fal’Rath, lend me your ear! Check our explosive first video bomb blog of the new year!! That was a reference to our latest short, and I apologise – that was a very bad pun. You caught me Calahan-ded. Ha! Okay, I’ll stop… Eden-tually… … … … Anyhow, a few quick things to keep in mind: our ‘Miniseries‘ will now be referred to as our ‘Pilot‘ from here on out, and we are now working on it in post-production full-time! Next, we plug our Short Stories from Fal’Rath, which, if you have not seen yet, you totally should! 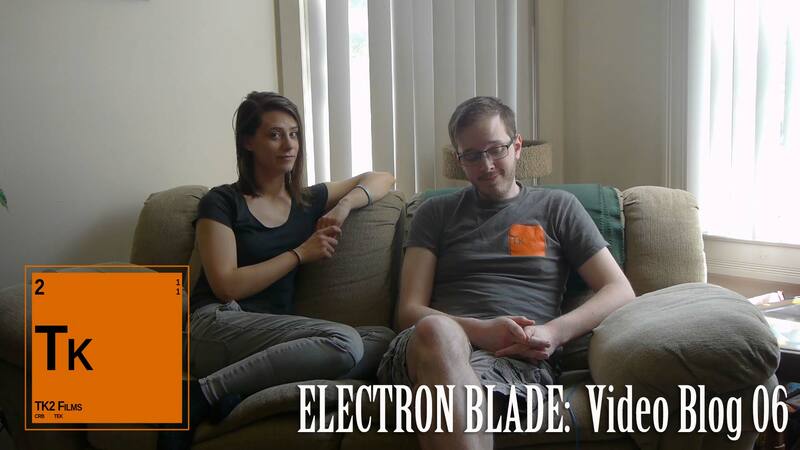 It’s the perfect Kai-nd of thing to satiate your hunger for all things Electron Blade while we work on the Pilot! 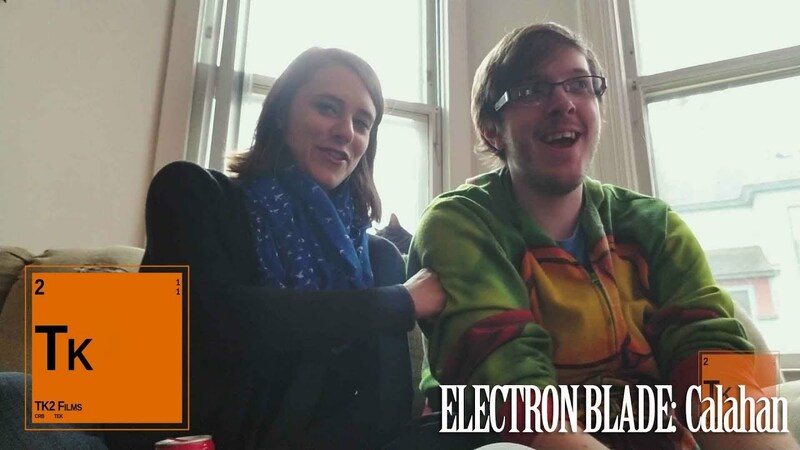 We talk about the wonderful month of March and why it is special (we’re going to be back on set, and our lovely Patreon donors will be able to get their walk-on role!! – if you have not yet signed up, there is still time!). Lastly, we give a shoutout to some of our team members and share the wonderful news that we are working very diligently to ensure that our generous donors will receive their gifts very soon! 21 January 2018: Ironwood Part 2: An Oracle Is Up! Hello devoted followers of Eden! We have some good news, the second chapter of Ironwood is up on our blog page: Short Stories From Fal’Rath! It’s been a tormentous week of waiting, and we appreciate your patience and your wonderful support as we bring to you our latest chapter in our Ironwood series: An Oracle. If you have not yet seen it, Ironwood Part 1: Kai Fae, is online for your viewing pleasure. We also have a comments section that is active, and we would love to hear what you think! Don’t be shy, we don’t bite… except Astoria… she cray. 14 January 2018: Short Stories From Fal’Rath is LIVE!!! We are so excited to finally reveal to you our latest content via our new blog site: Short Stories From Fal’Rath! You can check it out our first installment, Ironwood Part 1: Kai Fae, via the NavBar at the top of the screen! 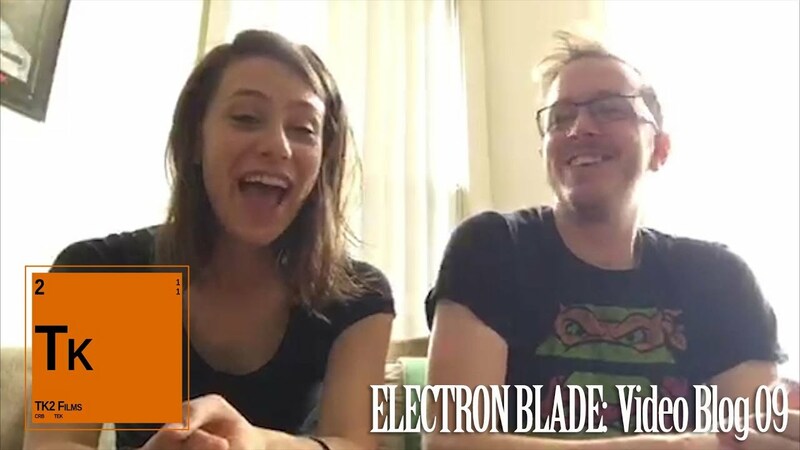 In our weekly posts, we will reveal short stories, audio logs, and video logs, so don’t forget to check us out every Sunday to keep up with the freshest updates from Fal’Rath and stay up to date with all things Electron Blade! 2 January 2018: Oh My Eden! SO MANY VIDEO BLOGS! AND CALAHAN! WE’RE BACK! WITH CALAHAN AND UPDATES! YAY! Check out our latest release, Calahan, on the right! Although we have periodically released new content and video blogs via YouTube the past six months, we’re finally bringing them to our webpage. You can find our older updates by clicking our archive link above! To start off, our summer shoot was a smashing success! 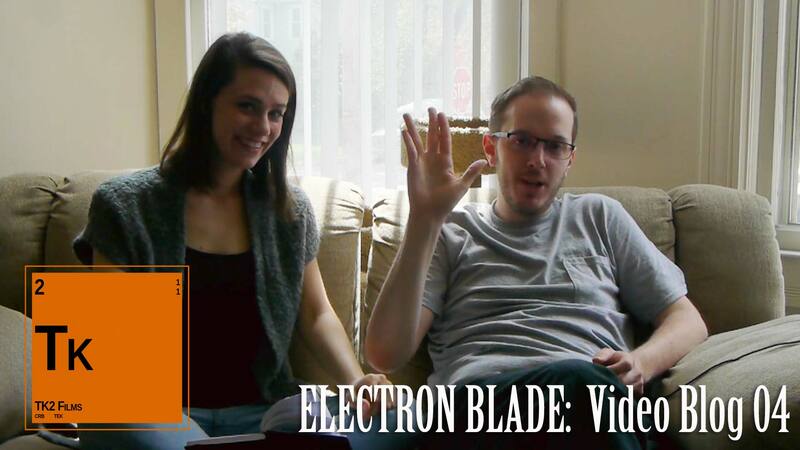 We wrapped up the final scenes from our miniseries shoot in mid-August and have been busy editing, organising, writing new content to expand our world, and working with talented and enthusiastic new faces who are helping us tell our story and taking Electron Blade to the next level! To see how we got to this point and where we’re going, check out the video blogs to the right for more information. In November’s video blog, we discuss the recently released fight short and give an update to our next short, Calahan. 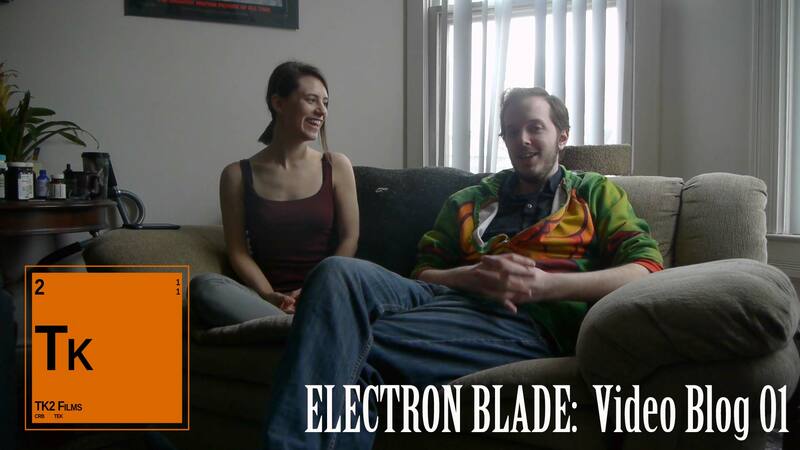 We are revamping our Patreon video with interviews from our actors and team members. We also give a shoutout to our good friend, Erik Ladendorf, and Benton Reid makes a cameo appearance. After our summer shoot, we have been diligently working, and we recently released our fight short! Also, we talk about our upcoming short, Calahan! It’s gonna be the bees knees – whatever that means. Much wow! Very yes! 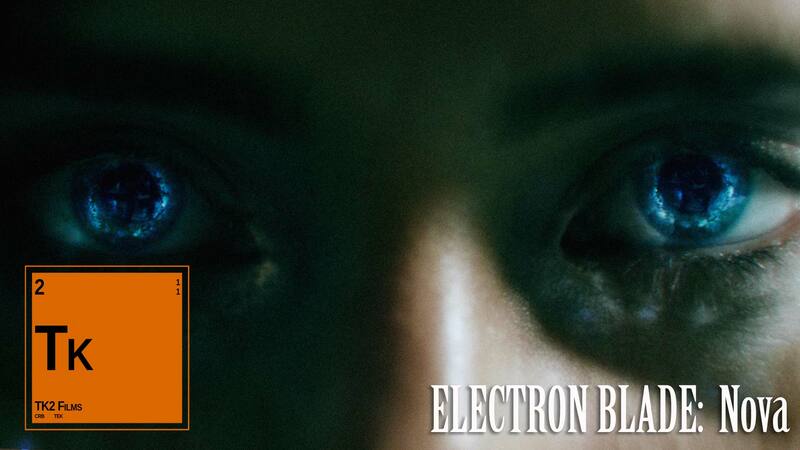 It was the first instalment that we filmed back in March, and we hope to release it very soon! We also have our graphic artist, Toni Davis, working on our graphic novel script, and we are super stoked about that, and you should be too because Toni is literally the best! We give a shoutout to Benton, the Davises, and Paden McCown, one of our Executive Producers, who are all in the background providing a much deserved applause at appropriate times. We give yet another shoutout to one of recently-joined producers and good buddies, Erik Ladendorf. We also discuss our upcoming sizzle reel – Tommy, what’s a sizzle reel? Tune in to find out! In this week’s video blog installment, we start off by showing some of the extensive details from the city of Qoris. We discuss our progress on our graphic novel script, show samples of our concept artist’s – Toni Davis – work, talk about putting the finishing touches on our fight short, and get to know our actor/producer, Rick Trombley. Lastly, we talk about another one of our projects, Runaway, being featured in a film festival in New York! Much of the time, the set seemed to follow Murphy’s Law. However, things worked out in the end. Watch the video to find out how! On this week’s video blog, we recap on our recent shoot at the Ann Arbor District Library and give you a sneak peak at the footage from that short! We also discuss our upcoming miniseries shoot, the logistics of how we can shoot a video blog during the shoot while exhausted – *spoiler* we won’t -, and we find out who is Tommy’s favourite Loony Tunes character. Lastly, we wrap up our blog with an interview with our talented graphic novel concept artist/actress, Toni Davis. This week, we illustrate the development of the city of Qoris in all of its detail and complexity, mention our upcoming shoot – featuring Phillip Shaun DeVone -, discuss the progress we have made in pre-production in our miniseries shoot, and interview 1/2 of our costume design team – Brittney DeShano! Trouble in paradise! The recent edits of the miniseries means a redistribution of storyline content from the shoot to the graphic novel, which was a necessary evil. Callie and Tommy reveal why they would make terrible parents, Callie points to herself, and we introduce actor Benton Reid as the face of Kai Fae in this week’s exciting and neature-filled video blog! 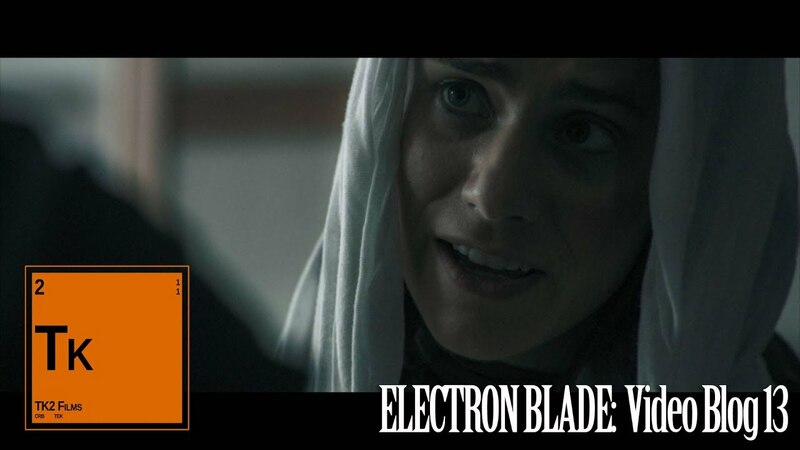 In this week’s edition of Tommy Records On His New Phone, we talk about our latest design for K’thal’s blade, we discuss casting for our upcoming miniseries, and we introduce the latest addition to our production team, Rick Trombley. Callie saves the day when Tommy forgets his camera. We discuss the official release of Terris, our completion of the miniseries script, and our movement into pre-production in this week’s video blog. This week, we introduce a new rifle prop, discuss the timeline for the miniseries, and talk about the perks for Patreon Donors. 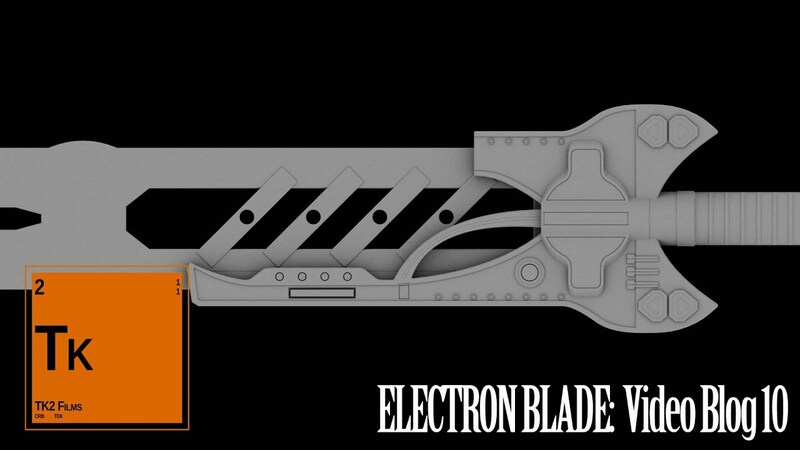 We unveil the second installment in our line of Electron Blade props – the Q7 Blade -, we introduce and discuss the controversial Q7 – Quadrant 7 -, and discuss the our plans for our miniseries shoot! May 16th, 2017: Video Blogs, Miniseries, and More! 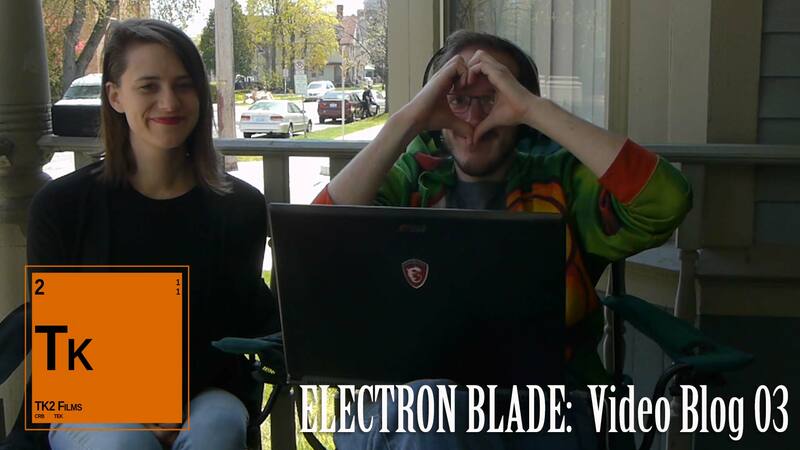 It’s that time again, more updates for Electron Blade! This comes primarily in the form of new video blogs whilst we put in a lot of hours to finish up more shorts for you all. We’re taking a couple of weeks off from releasing shorts so we can make sure they live up to the personal bar we have set for ourselves. In the meantime, we’ve been working diligently on the scripts for our miniseries. Check out the video blogs to the right for more information. 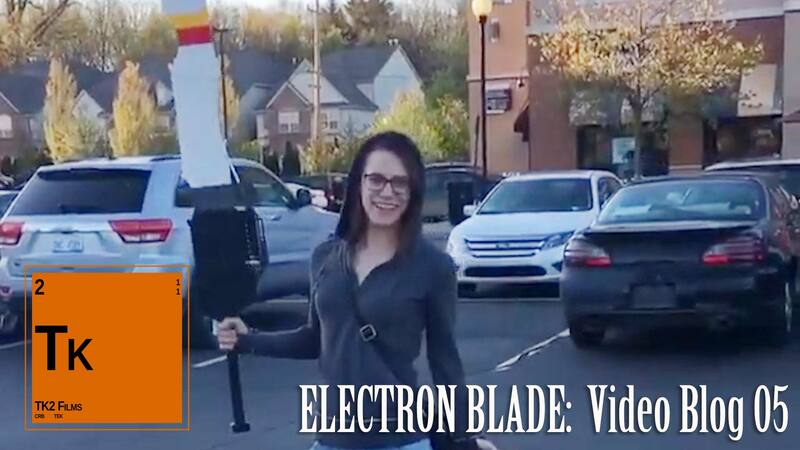 We show off the very first work-in-progress version of the physical Electron Blade prop, talk about our Patreon, and discuss the timeline for the miniseries. We discuss the progress on writing for the mini series, why there was no short this week and won’t be one next week, props we’re working on for the next video blog, and more! I apologize for not recognizing the closure of our campaign when it happened. The campaign ended Monday morning with an official donation amount of $8,893. Whilst this is only 15% of what we were asking for, I still can’t tell you how incredibly appreciative I am! 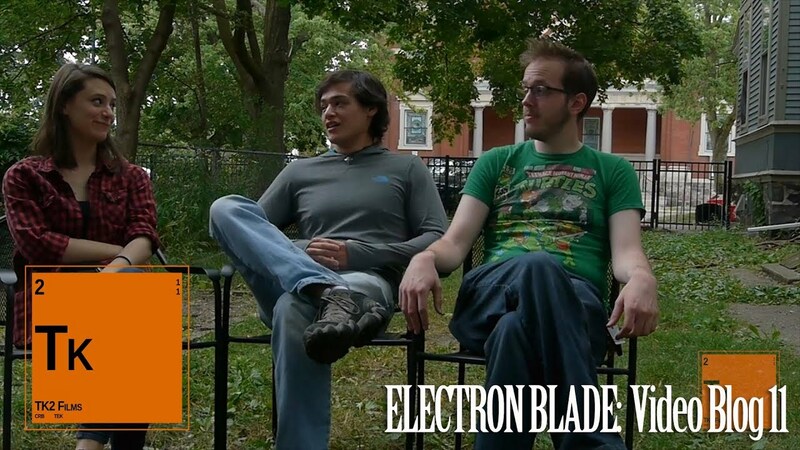 The original plan was to make a TV-length pilot episode with the $60,000 we were hoping to raise. However, Callie and I have spent a good deal of time rethinking our plans and figuring out exactly how we want to move forward, which is why we held off a couple of days to make any announcement. That said, we’ve settled on a direction and are so incredibly excited! 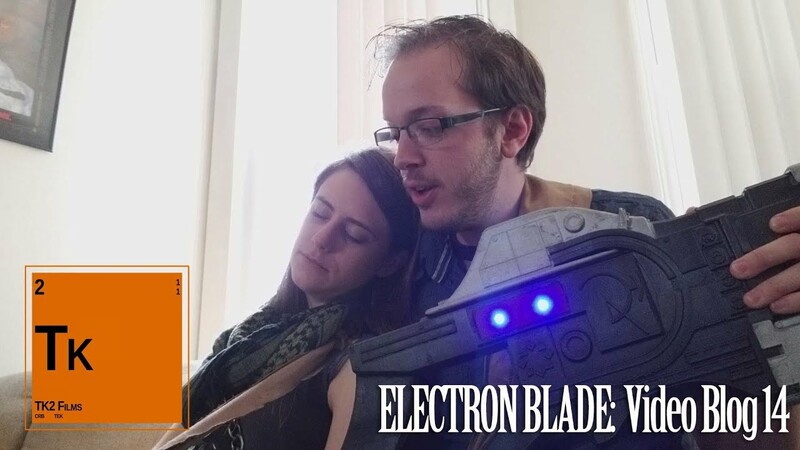 With the money you’ve donated to us, we’re going to produce a YouTube miniseries that will tell a complete story arc that leads up directly to our pilot. You may be wondering, what’s the difference between a YouTube miniseries and the pilot? Also, aren’t we already doing shorts? Yes, we are already doing shorts, but the shorts you’ve been seeing can be considered vignettes. They aren’t typically full stories in and of themselves, but rather snippets of stories that show a little bit of our characters and universe. The YouTube miniseries will comprise approximately 10 episodes, each running 6-8 minutes in length, and will tell a completely serialized story from start to finish. 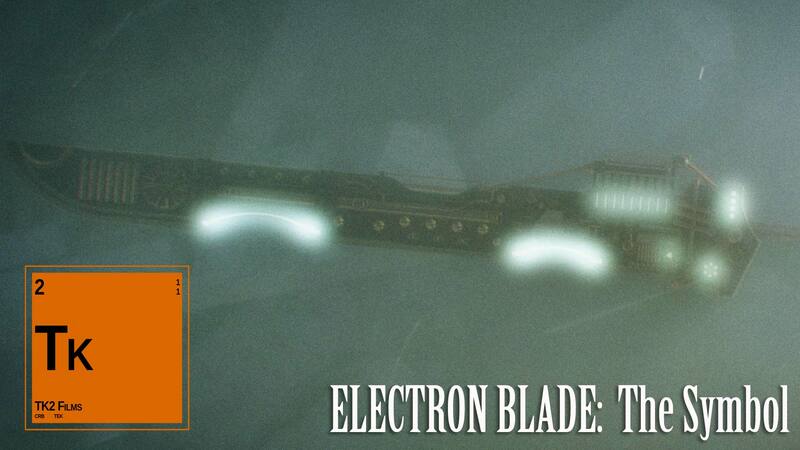 We will learn more about the mystery, the wonder, and the terror of the Electron Blade universe. At the end of this process, we’re hoping to try again to raise the funds for our full pilot. Beyond that, since we didn’t reach our original goal, some of you may be wondering what the status of donor rewards will be. We absolutely will fulfill all the donations made. 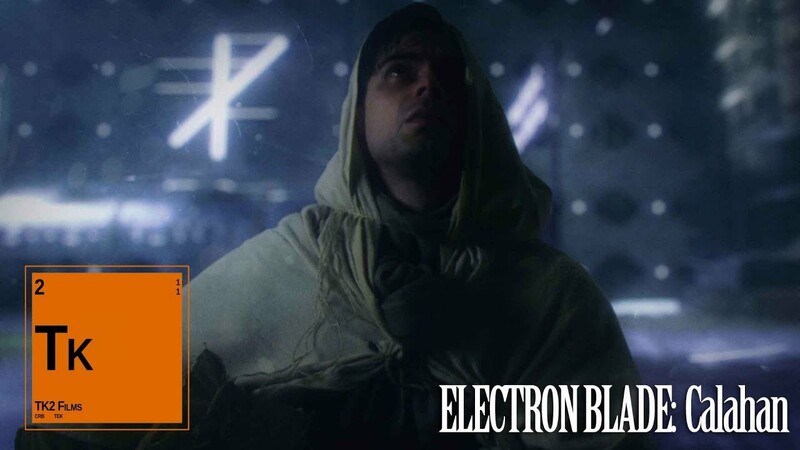 The only caveat is that some may take longer to arrive; ie the executive producer credits will not be able to be fulfilled until we’re able to produce the pilot itself, but rest assured they will be fulfilled. All other rewards will be fulfilled as we continue to move forward! 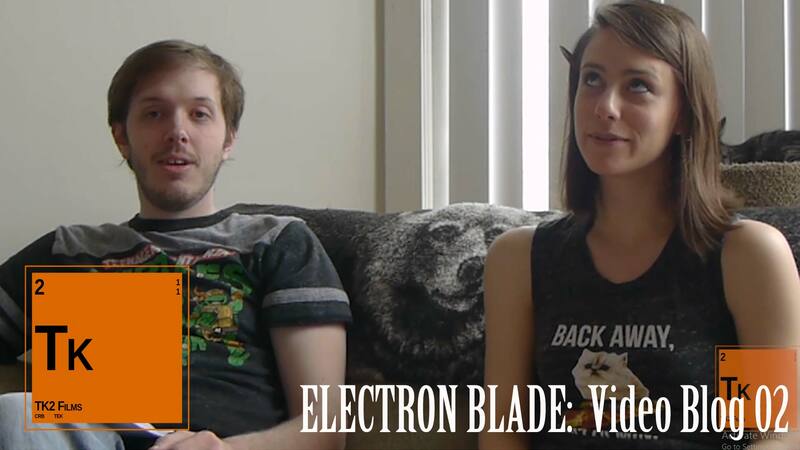 In the meantime, we have a new video blog and new short vignette for you to check out! It’s Tuesday! 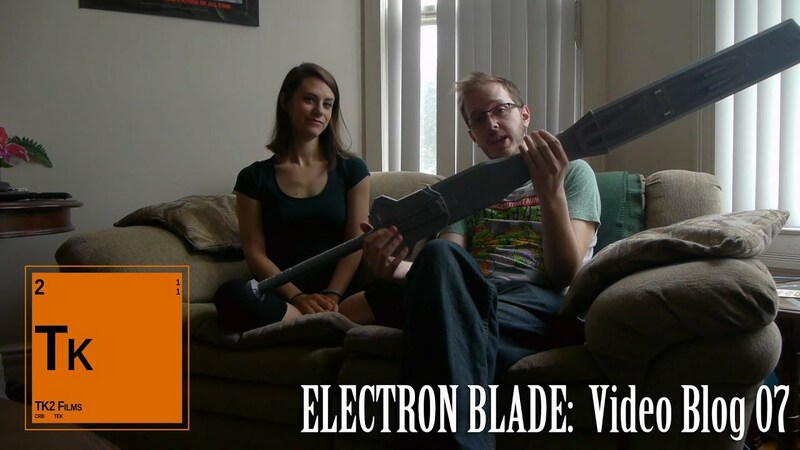 Which means it’s time for another Electron Blade video blog. This week we talk about our short films and plans for future shorts, the Indiegogo campaign, as well as answer questions from the community! If you have a question you’d like answered, please be sure to submit it via the contact box at the bottom of the page! We’ve just released our second short film (or vignette, if you prefer), this time focused on the character Nye Tysagrin. Born in the city of So’Fal Kor, Nye has always been gifted. From an early age, it was clear her intellect was meant to serve Eden, but after vigorously training for 18 years, she was not Chosen at So’Fal Kor’s Culling. With passion in her heart, and a strong desire to live in Her light, Nye moved herself to Aaru’s Gate to begin working with bioagriculture to help advance the growth of food in Centrus, Eden’s home. 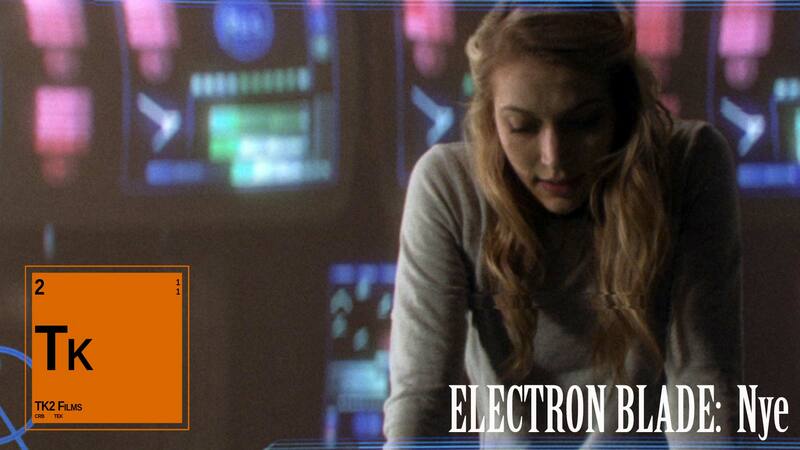 She quickly advanced and was soon recognized by Eden herself. At the age of 24, Nye was working side by side with Eden’s best to help find and create Eden’s Perfect Host, but even with her motivation and drive, will Nye be the one to bring Eden her Perfect? 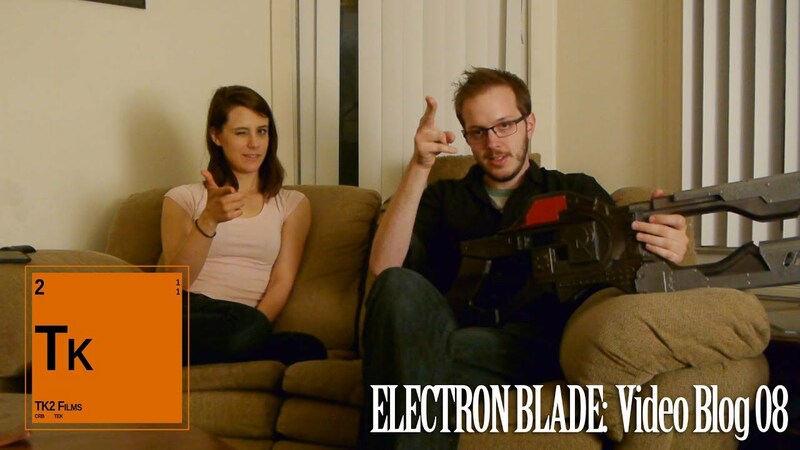 Today marks the release of our very first Electron Blade video blog! 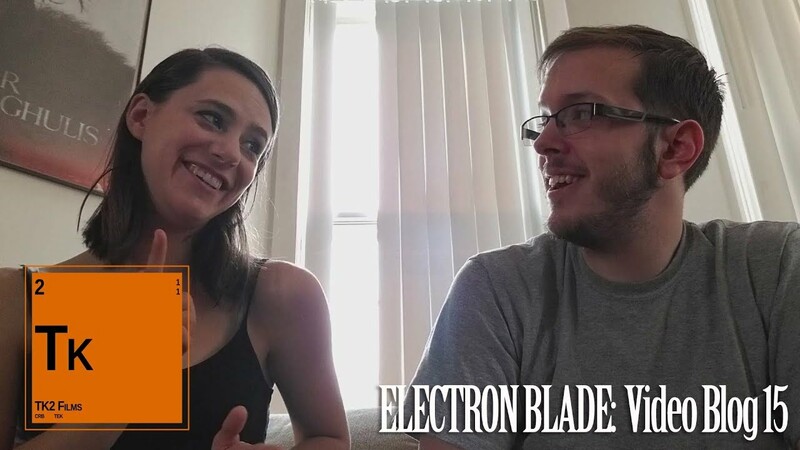 In this episode, Callie and Tommy talk about launching the project, the crowdfunding campaign, future media releases, our amazing cast and crew, props and donor rewards, and more! If you have any questions, feel free to use the contact box at the bottom of the page and we’ll answer it on next Tuesday’s episode!